Welcome to yet another entry in one of the longest-running series of blog posts on this Sanctum Sanctorum Comix blog; wherein I showcase my collection of DOCTOR STRANGE related apparel (hats, ties, shirts, unmentionables…). This time, we're in (what should be) the FINAL entry of a sub-series of posts which feature assorted Ancillary Accessorizing Artifacts; (patches, buttons and assorted bling). 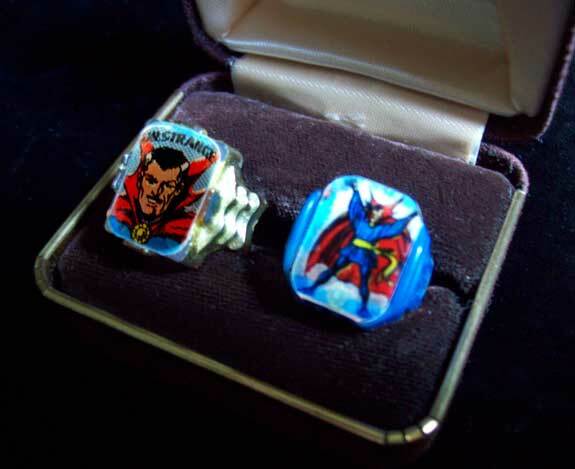 Anyway… in THIS post, we’re taking a look at DOCTOR STRANGE related RINGS (official and non)! The first official Doctor Strange ring was the 1966 Vari-Vue Flicker Ring. Sold either in gumball machines or carded the rings feature lenticular images which, when tilted slightly would show one of two different images (I've photographed the rings angled so that we can see both images - one on each). This is the blister card- which, sadly, I do not own as of yet. I'll get one eventually - especially since Doctor Strange IS pictured on the card. 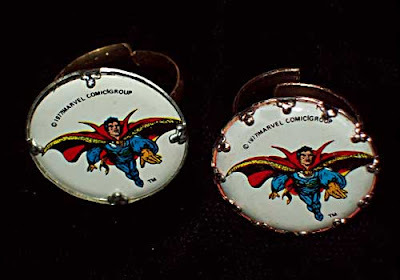 The next (and sadly, last) officially produced Doctor Strange ring is the 1977 "gumball machine" ring. The ring came in two different variations - either with 12 clasps holding the image disc in place or a later version with only 4 clasps. 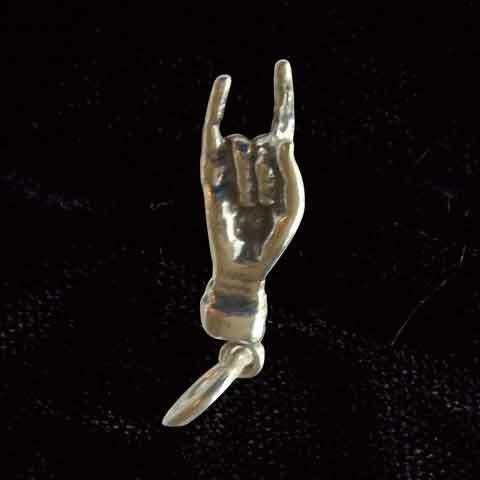 Measuring about an inch wide, this item was also manufactured and sold as a pin and a keychain (see pic below). 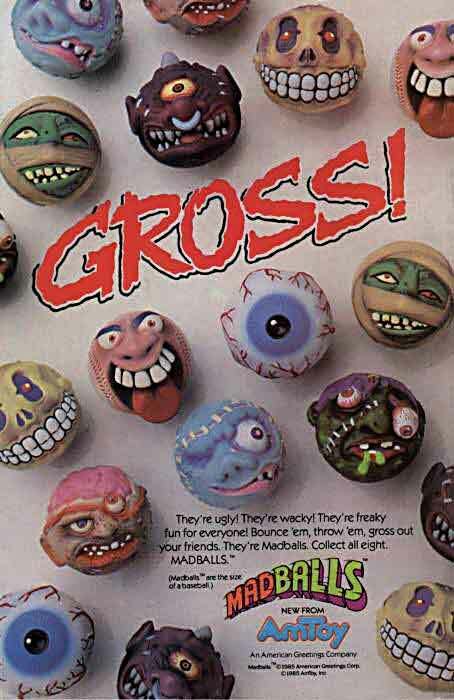 These were available as prizes from carnivals, theme parks and yes... gumball vending machines. 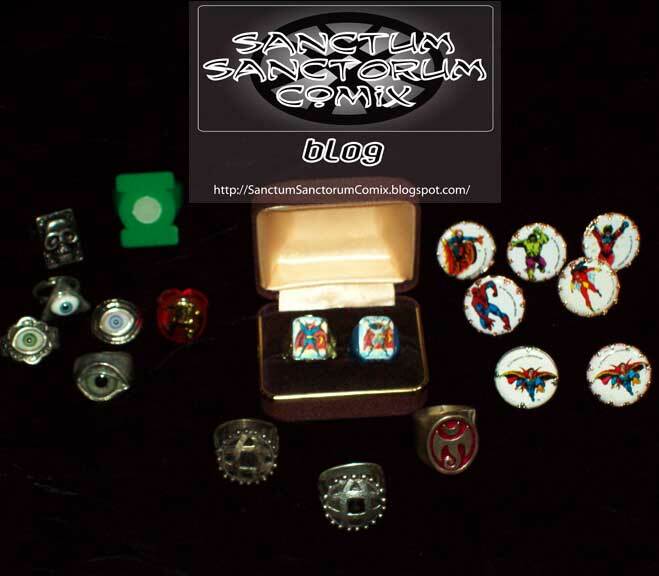 There were a total of 6 rings, DOCTOR STRANGE, Ghost Rider, Hulk, Captain Marvel, Spider-Man and Spider-Woman. Once official product stops being produced, die-hard losers...er... fans, like me can only hope to make their own and/or find cheap stand-in items to satisfy their desires. Luckily for you, I am such a loser - er, fan. 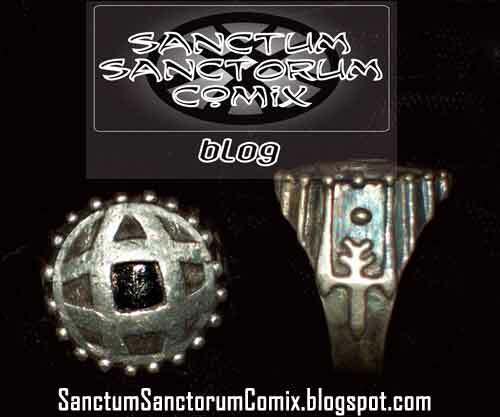 The first Custom-Made item that I had made was this solid silver ring with a stylized version of the window from Doctor Strange's Sanctum Sanctorum - as inspired from Doc's 1978 TV movie. I actually had two of these made back around 1994. One to wear and one to keep in my display case. The one I wear is on the right. The display version is tarnished and is in need of a good silver-cleaning. 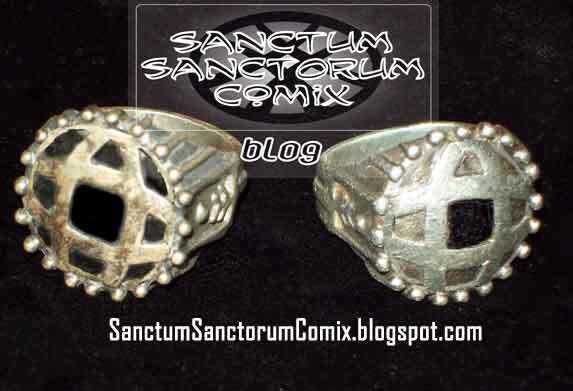 If you want to read more about these rings and the film-ring that inspired them, feel free to check out the old post that I originally devoted to this item way back in 2009 [HERE]. While on the subject of custom-made rings, there is this next item. 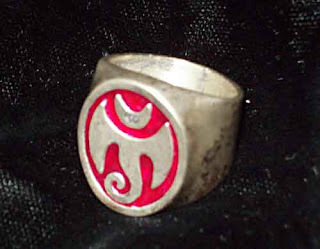 This solid silver ring is cast with the version of the curly-tailed demon-symbol which Doctor Strange briefly wore on his tunic. However, like the Movie-ring above, it is also tarnished and in need of a cleaning, but also had a blog post all it's own several years ago in 2009. Read all about it- and see pics of it when it was still all nice and shiny [HERE]. While looking for other Dr. Strange mystic-themed rings, I came across this silver ring shaped like an eye (complete with glass eye inside). Obviously, any "all-seeing-eye" item is thematically tied to Agamotto in my mind, as so when I saw these next cheap cosmetic jewelry rings I had to have them as well. Made of a "non-metal" these were all found in a party supply / costume shoppe. The triangular one nearly identical to the amulet that I found at the same time (and seen in the post featuring amulets [HERE]). 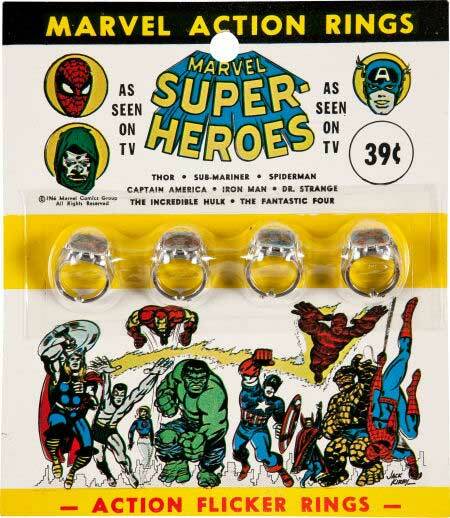 I do have a few "6-Dimensions" themed comic rings as well. 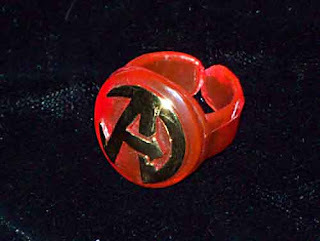 This ring is made of red plastic with a gold foil embossed "AVENGERS" iconic "A" symbol. It came with a Wonder Man action figure by ToyBiz from the "Avengers: United They Stand" cartoon in 1999. While I have owned it since then, I've been glad to have kept it since Doctor Strange has since joined the Avengers. Next, is the "metal" ring that was released as a promotional product for the PHANTOM film of 1996. Why do I have one? Well... while the Phantom has no ties to Dr. Strange, it IS pretty cool. 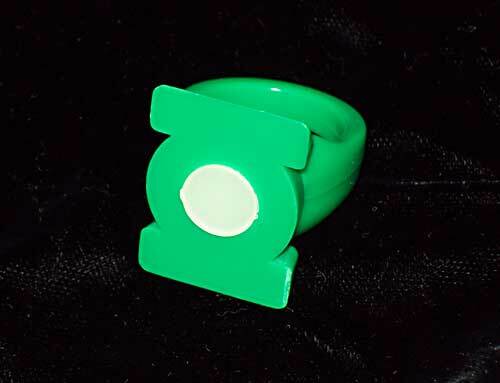 My final ring that I have in my collection is a glow-in-the-dark GREEN LANTERN ring. If anyone has to ask WHY a comic fan has a Green Lantern ring, well... I don't know WHAT to tell you! A more magic ring there can not be found. And with that, I wrap up this sub-series (within a series) of assorted ARTIFACTS of FLAIR and DR. STRANGE GARB. Thank you for wading through all the assorted swag and gear in the series. And if you missed ANY of the previous entries, feel free to use the handy-dandy navigation menu below. 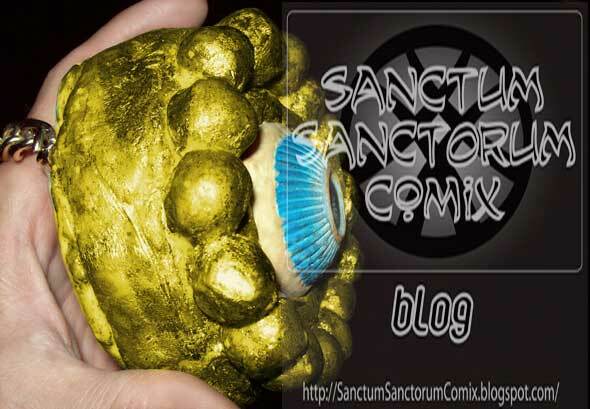 (Part 3a: EYE OF AGAMOTTO). Of all of Doctor Strange's visual accoutrements, aside from his flaring red cloak, the most recognizable item on his person is the All-Seeing EYE of AGAMOTTO. So, it would only be logical for any fan of the good Doctor, who might be a collector or curator of Dr. Strange items would inevitably have at least one of their own. As shown in my most previous posting (showcasing: Amulets, Medallions, Pendants & Charms [HERE]), this is but one of several "Eye of Agamotto" amulets that I have, but it is the only one that I made myself (not counting Eye of Agamotto Buttons & Pins which were shown in that entry [HERE]). Created by myself back in 1987 as a part of my DR. 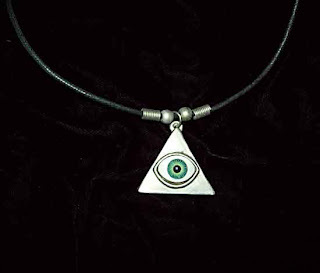 STRANGE Costume (image below, but the full write-up can be seen in its own post [HERE]), this All-Seeing Eye was crafted out of a molding product called “Friendly Plastic” (a product that was tiny beads of plastic that you would submerge in hot – almost boiling – water so that it would melt and become malleable. You’d then sculpt what you wanted, but would constantly have to re-submerge the item in the water to continue to work with it. “Friendly” it was not). 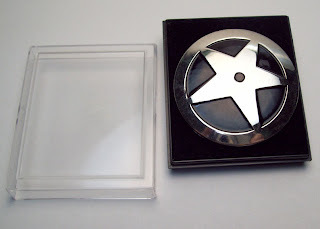 The Amulet as a whole is 4 inches wide and 2.25 inches thick, and due to the nature of the plastic from which it was made, it is surprisingly dense and heavy. The EYE that is encased within the Amulet is a molded foam-rubber ball, one of a line of toys popular in the 1980’s called MADBALLS (this is, of course “Oculus Orbis”). Aside from the necessity of encasing a madball (or at least half of a bisected madball) within the amulet, I also opted to mold the medallion 2.25” thick to emulate the design given the Eye by artist Michael Golden (in the style he illustrated in the mid-1980’s). The “gold” chain was permanently attached by molding a back-plate behind the Amulet with the chain running between within a slightly raised channel. The entire amulet was then coated in gold-leaf (not real gold-leaf, sadly) to ensure a look of it being carved out of ore.
To help in achieve the appearance of the artifact being something wrought and not “manufactured”, (like a real mystic object should,) I did not smooth out the surfaces. Finally, to give it a glow, I painted the “white” of the eye (and a ring around the pupil) with “glow-in-the-dark” paint. 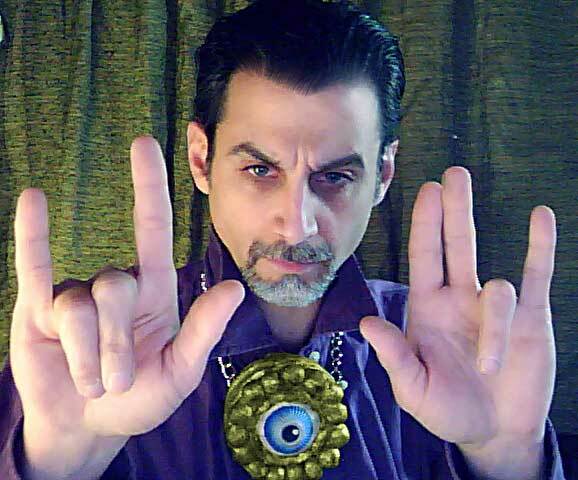 Just for kicks, as a contrast to the pic above from 1997, here is a shot of me wearing the eye “today” (OK… a couple of weeks ago – for a future posting). Welcome back once again as we take a look at an entry in one of the longest-running series of blog posts on this Sanctum Sanctorum Comix blog; wherein I showcase my collection of DOCTOR STRANGE related apparel (hats, ties, shirts, unmentionables…). This time, were in the 3rd entry of a sub-series of posts which feature assorted Ancillary Accessorizing Artifacts; (patches, buttons and assorted bling). 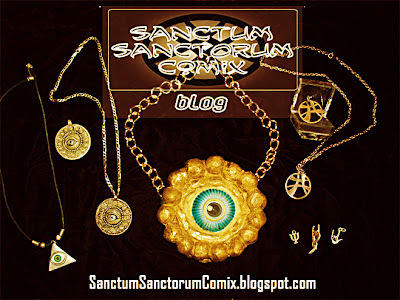 Anyway… in THIS post, we’re taking a look at DOCTOR STRANGE related AMULETS, MEDALLIONS, PENDANTS and CHARMS (y’know… dangly-things you wear around your neck). Once again, the best way is to go chronologically, by year of acquisition (or creation). …Created by myself back in 1987 as a part of my DR. STRANGE costume (which can be seen in its own post [HERE]). However, I’m not going to get into this item too much here, as it deserves a post all of its own (which it will as the next entry of this current sub-series). I WILL say that it is 4” in diameter and 2.25” thick (and can be a lethal weapon due to its unusual weight and density. Seriously... you could totally kill someone with this thing). Next, is another of my custom-made bits of swag: a Medallion, cast in silver, with black enamel backing, in the shape of the window of Doctor Strange's Sanctum Sanctorum (or, at least, my rendition of it), which I commissioned a silversmith-artist/friend of mine to make to my specifications in 1992 (or 1993). 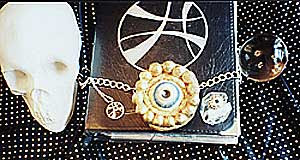 The amulet is 1 and 1/8 inches (3cm) in diameter, and I had two made: one to wear and one to keep in my display case. However, this item did indeed already garner its own blog post (which can be found in Part 2 of the “Magic Rings and Mystic Bling” series [HERE]). Read all about it there! The next item is a bit of self-indulgent “what-iffery”. A 1.5” wide triangular (or pyramidal) shaped “Eye of Agamotto”. 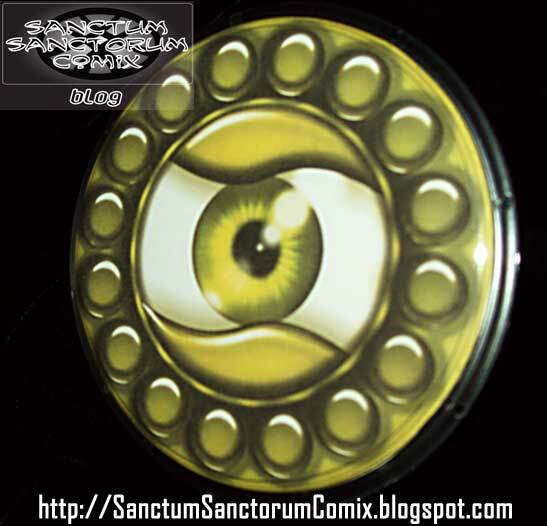 My reasoning for it harkens back to issue #13 of the “DOOM 2099” comic, wherein it was stated that there were 3 Eyes of Agamotto. So in my mind, if the 1st “lesser”eye was the original square amulet, and the 2nd “greater” Eye being the round “Eye of Agamotto” we all know and love, then the 3rd eye should be a triangular one, no? Anyway, I found this in a Party Supply store where I was painting a mural (during the time when I was a mural artist – painting on the walls of business and palatial mansions alike) in 1995. While it might actually be merely a party-favor… to me it was a fanboy discovery. 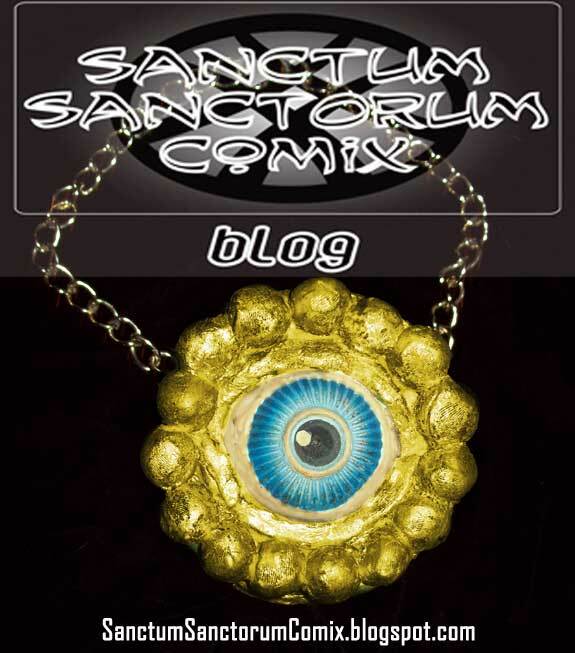 Since “All-Seeing Eyes” are the obvious contender for mystic amulets, it’s no surprise that the next entry is touted not only as “the Eye of Agamotto” but also by its real nomenclature; the ‘Eye of Buddha”. 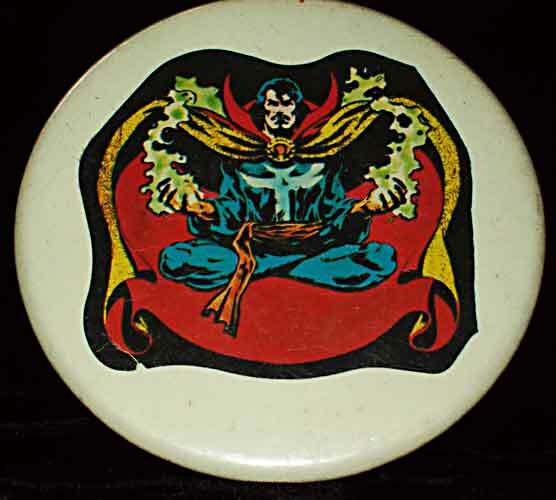 When Steve Ditko designed Doctor Strange’s “Eye of Agamotto” the likeness to the “Eye of Buddha” was too close for coincidence (much like the likeness of the Wand of Watoomb to another mystic item, a Tibetan Dorje). Anyway, these Eye of Buddha / Agamotto amulets are 1.5” in diamteter, and like many items in my collection, I have one to wear and one strictly for display. 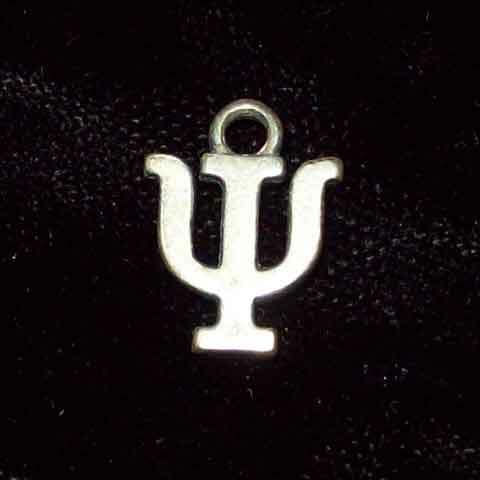 Made of sterling silver, and .5" high/wide... while this might LOOK like the symbol that is on the front of Strange's tunic, it is in fact the 23rd letter in the Greek alphabet; "Psi" (but c'mon! it's close enough). 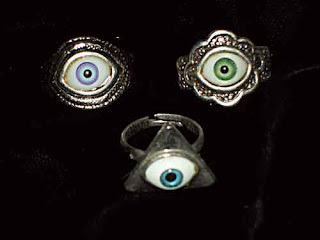 The first is a “mano cornuto” (“horned hand”) charm, designed to ward off the evil eye. 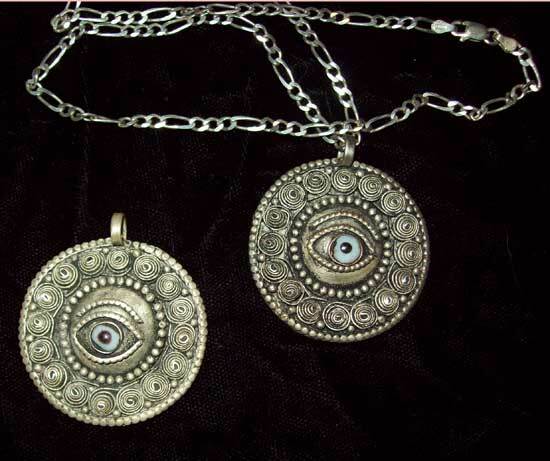 I had one similar to this one many decades ago, acquired from someone, somewhere, at some time in my youth (until it was presumably lost during a move), until I bought another fairly recently as a replacement (strictly for my Doctor Strange collection, as I am unconcerned about the "evil eye"). 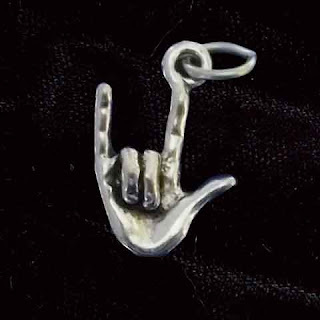 2.1cm high, .8cm wide, made of sterling silver. The second hand gesture is the “American Sign Language” gesture for “I LOVE YOU”. 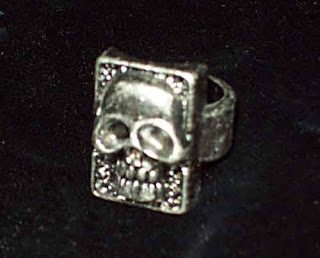 17mm tall, 11mm wide and made of pewter silver. And if we’ve known anything about Doctor Strange over the decades, with his hands kept in that position whist casting magic, he’s been saving the Earth-Dimension from evil with the power of love for over 50 years! Come back soon for a SPECIAL ENTRY showcasing the EYE of AGAMOTTO (shown at the top of this post) in a solo entry! Then, come back for the finale of the Artifacts of Flair sub-series: MAGIC RINGS! While here in the USA, this is a holiday specifically dedicated to honoring our fathers, in many other cultures, such a tradition of paternal respect is a daily commitment (as it should be). 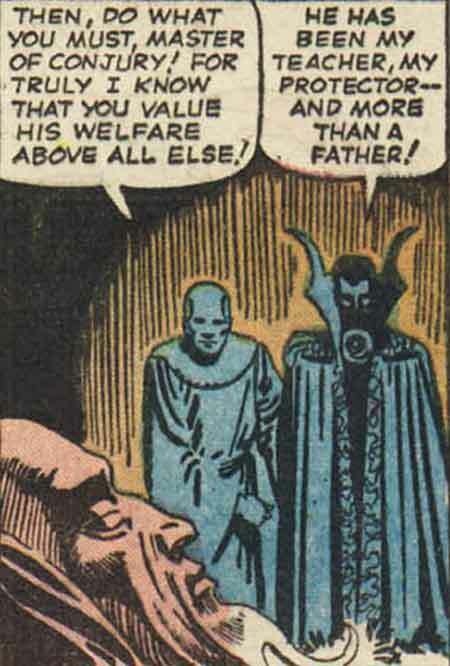 So, it is of no surprise that when DOCTOR STRANGE (a man raised in the West, but given a new life, a new start in the ancient East,) speaks to (or of) his mentor, the ANCIENT ONE - while he ALWAYS refers to him as "MASTER" he also speaks of him as his FATHER. The respect, care and love that each of these men feel for each other is palpable. Thus Stephen Strange journeys to the ancient past, but alas the candle's light which serves as a beacon for his return is extinguished, causing his mentor to think him lost forever. However, all hope need not be lost for... his son returns to him! The concern for the younger mystic before his departure, and then the absolute despair and sorrow when it is thought that Strange was forever lost... only to give way to the exultation and heart-lifting gladness when his "son" returns is a hallmark of their relationship. Certainly, the Ancient One has ever called Stephen Strange "My Son", but whenever Dr. Strange lets go of the formality of his mentor's title of "Master" he speaks endearingly of his as "...more than a father." Teacher, protector, more than a father... for isn't that what a true father is? More on the tender and tight-knit bond between these two men can be found in comic-afficionado Colin Smith's long-running Sequart article on the Mystic Masters (which helped inspire this very post) [HERE]. 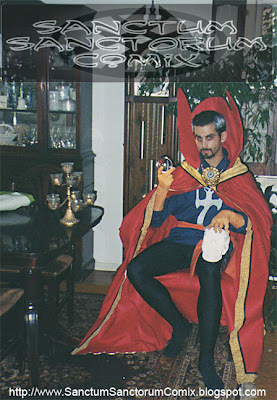 But what of Eugene Strange, the paternal parent that actually sired Stephen Strange? A portion of the Pin Collection in its revolving glass display case habitat. Welcome back for another exciting entry in one of the longest-running series of blog posts on this Sanctum Sanctorum Comix blog; wherein I showcase my collection of DOCTOR STRANGE and "6-Dimensions" related apparel (hats, ties, shirts, unmentionables…). This time, we're in the 2nd entry of a sub-series of posts which feature assorted Ancillary Accessorizing Artifacts; (patches, buttons and assorted bling). While in our previous outing, we looked at my collection of PATCHES [HERE], in THIS post, we’re taking a look at BUTTONS and PINS (or “badges & pinbacks”, if you prefer that nomenclature). Buttons, Cloisonné Pins, Badges (and of course, all separated into 2 categories each; "DOCTOR STRANGE" and then "6-DIMENSIONS" characters), and even a few custom-made items. Once again, the best way is to go chronologically, by manufacture – and broken-down by type (Organized? –or- OCD? – YOU decide!). A whopping 3.5" wide, this giant pin let its wearer proclaim to the world that they were TRUE BELIEVERS! With the heads of some of the more popular characters of that time, each taken from their respective comics, we do see a Steve Ditko drawn head of Doctor Strange. As you can see from the pic, mine has some age spots. Anyway, I'm sure I'll get a pristine copy sooner or later. 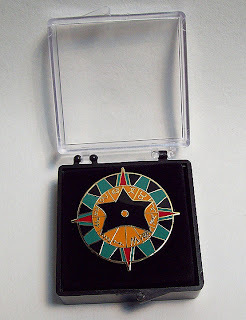 While not exactly "pristine", I have recently obtained a "very good" (maybe close to "near mint") condition pin. The only thing that degrades this copy is some minor defect on the left (near Daredevil's head). It's quite a nice one, notwithstanding, although, I guess that means I STILL will be on the lookout for a "pristine" copy. Measuring about an inch wide, this item was also manufactured and sold as a ring and a keychain (see pic below). 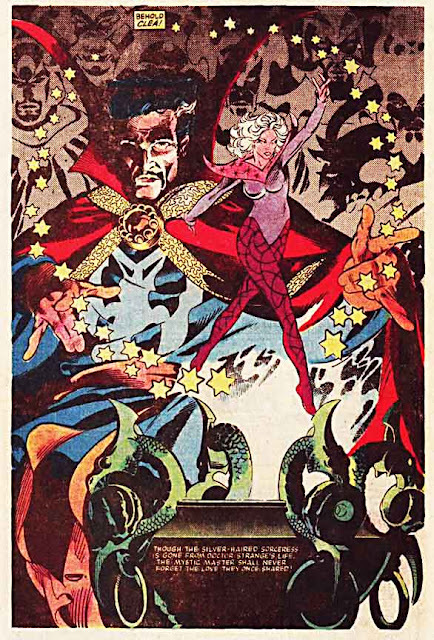 artwork by Steve Leialoha from DOCTOR STRANGE; Master of the Mystic Arts # 67. Yup. 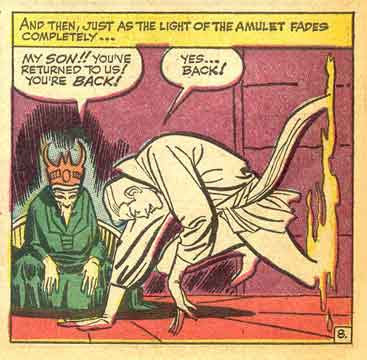 Nothing sells buttons more than an obscure panel wherein Shuma Gorath taunts our hero with a vision of his death. As far as I can tell, this is an exceptionally rare button. I've never seen another like it. Alright... you got me. 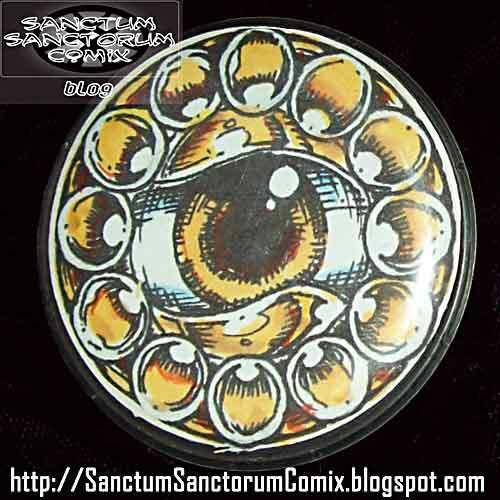 THIS isn't an actual Marvel produced "Eye of Agamotto" pin. It's actually a CBS Television lapel / hat pin. 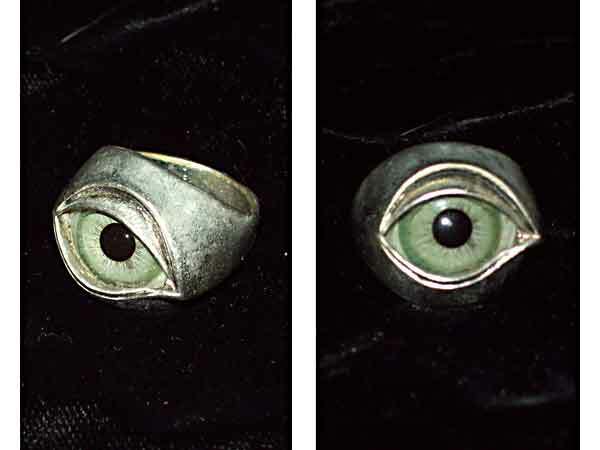 Made of golden colored metal (sorry, the pic has the shiny surface of the pin reflecting the black cloth all along the top half) and measuring a little more than a half-inch wide, it is the CBS "Eye" icon. These were made over the years, apparently, to be worn by CBS employees, but somehow some of them made it out into the secondary marketplace (presumably by pages, interns and mail-room clerks looking to supplement their income). 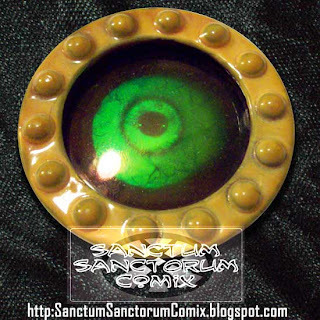 (and also a nifty, ersatz "Eye of Agamotto" as well). 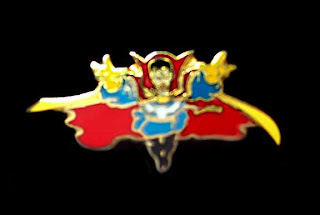 Displaying an image drawn by Steve Ditko of Doctor Strange from his 1st appearance in 'Strange Tales' # 110, this pin-back button came packaged with the "Marvel Classic Character" syroco statuette manufactured by Dark Horse Comics (Doc was # 5 in the 1st series [- and yes, I'll showcase that soon when I continue my series of Dr. Strange figures & statues]). As I already blogged about [HERE] there was a special edition of shirts and artwork of Marvel characters, licensed by design/apparel company; STUSSY. One of their t-shirt designs was used as their overarching emblem for the event and, as such, was also used for promotional materials (like, for instance... BUTTONS). 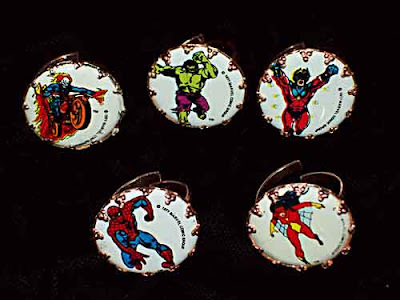 This 2.25" wide pin features images of multitudes of Marvel characters. 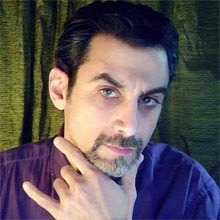 However, for the interest of this blog, obviously Dr. Strange is included. However, in a bizarre twist, take a look to the left and the right of Spider-Man. To the left is Doctor Strange's BODY, but to Spidey's right is Doc's HEAD! 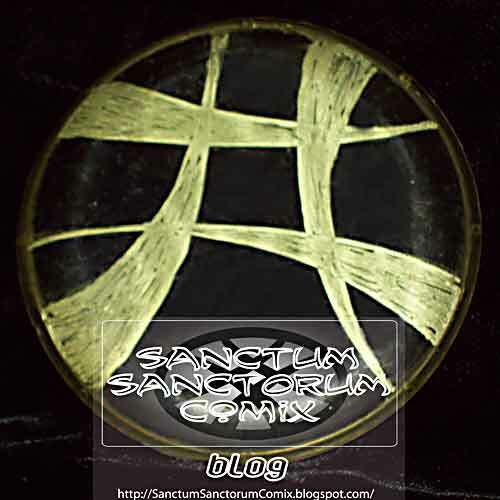 While some other characters were allowed to protrude over the boundry of the double "S" Stussy logo (Spidey, Silver Surfer, Dr. Doom, Hulk, Captain America and more...), obviously, having Doctor Strange's HEAD covering the end of the inverted "S" was the last straw, and as such, he had to be beheaded. That wraps up the "Dr Strange" section of BUTTONS (but fret not, there's more Doctor Strange Cloisonné and badges to come further in this post). Now we turn our attention to some "6-Dimensions" characters' buttons in my collection. Believe it or not; in 1976 Howard the Duck was an actual (write-in) candidate for President of the Unites States. Among the mail-away promotional materials you could get to support the "All Night Party" candidate was this spiffy pin touting Howard's slogan; "GET DOWN, AMERICA!" 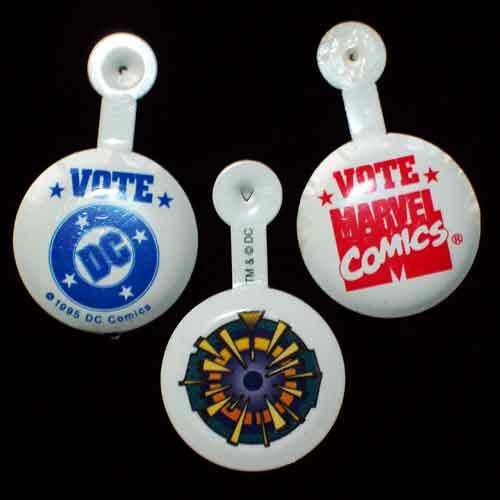 Issue # 8 of his series dealt heavily with his campaign and this pin was shown therein (as well as in mail-away ads in the Marvel Comics of those months surrounding the election). 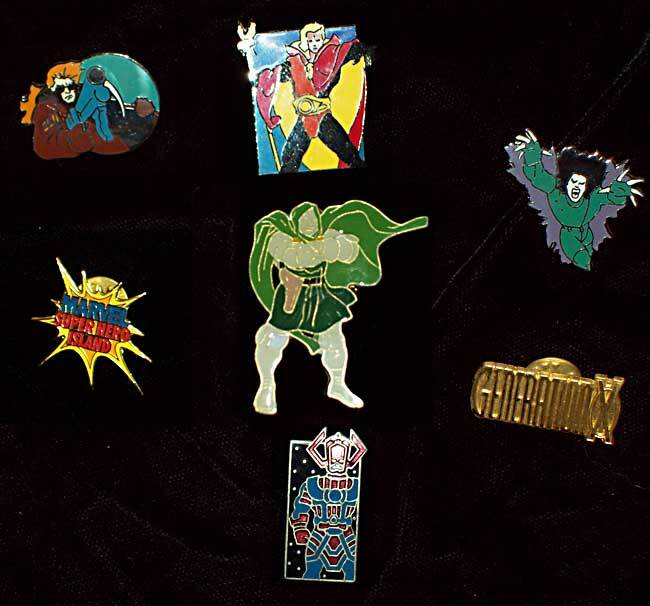 Here's a small smattering of "6-Dimensions" character pins from my collection. I've many more buttons and pins of my "6-Dimensions" faves than this, but most have been removed from the active collection and will go up on the eBay when I get around to it. All these are the same size 1.5" and are from 1986 and 1987 (except the Dr. Doom one from the 2099 line of comics - which is from 1995). 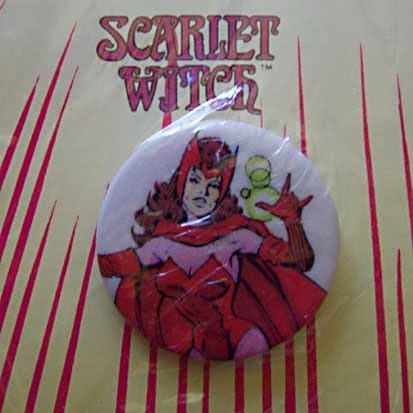 I've also recently obtained a SCARLET WITCH pin. One that I've seen online now and again. 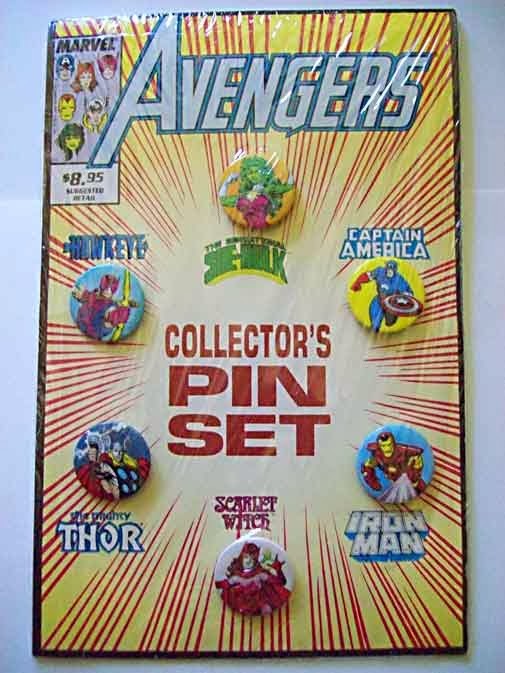 It's from a carded set of AVENGERS pins. I haven't taken her out of the wrapper, so... I guess that means I'm still in the market for either another set or just another one of her, loose. No SHIELD comic out at this time. A 6 issue deluxe edition mini-series (Nick Fury vs SHIELD) would start the following year. This could have been a promotional item to herald the new project. 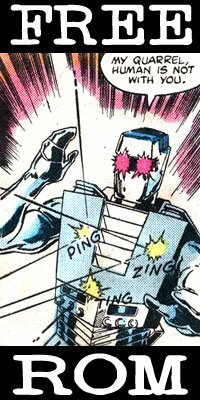 If I recall, the series dealt with Nick Fury discovering that SHIELD had been infiltrated and corrupted at its highest levels by shadow-agencies, so he had to re-start a new SHIELD with only a select core group of trusted individuals. I'll have to dig out the issues to see if this is a new design for that core team. The only buttons & badges that I (somewhat) regret selling off was my super-rare STARMAN badge and Cloisonné Enamel Pin! These two items were in my collection for years, until they sold on ebay [HERE]. 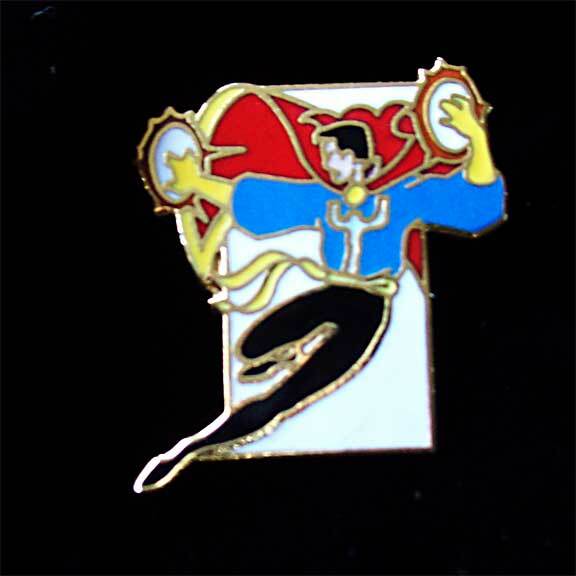 Now we return to items featuring DOCTOR STRANGE - this time showcasing Cloisonné Enamel Pins! Unlike all the rest of the buttons in the collection, these Cloisonné Enamel pins use a push-pin type of fastener (like a tie-tack). 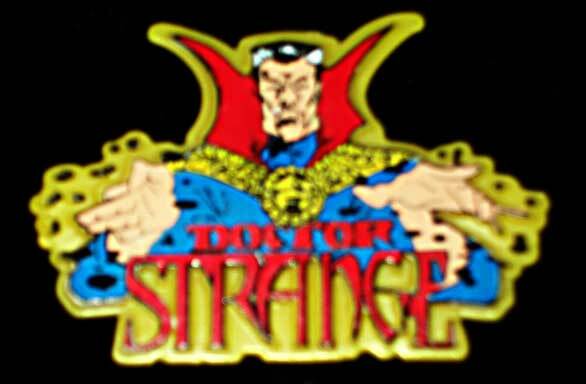 Doctor Strange logo from Strange Tales v2 and his "Sorcerer Supreme" series of the late 1980's. Doctor Strange in flying position. I searched for the source of this image in comics from several years prior to, and up to the month of its release, and could not find any that were a match finally FOUND it. It looks like the work of Mike Mignola, (but could also be that of Paul Smith or Art Adams) and I am now of the mind that it was drawn as a promotional pose and used, seemingly exclusively, for this pin (perhaps the eye-patch being added after-the-fact, since it was a small window of time wherein Doc wore one). It turns out that the original image is from SILVER SURFER ANNUAL # 2 (1989) and drawn by Ron Lim. The line work was simplified slightly for this pin (which is what gave it the Mike Mignola/ Paul Smith vibe, but I am 100% sure that I have found the source. As I guessed, the eye-patch was added after the fact (it seems the head as a whole may a fix, as it is the only aspect that does not quite match the art from the annual). 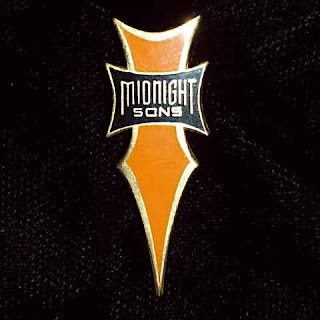 This is the "trade dress" logo for the 'Midnight Sons"' line of comics that Marvel had during the 1990's. 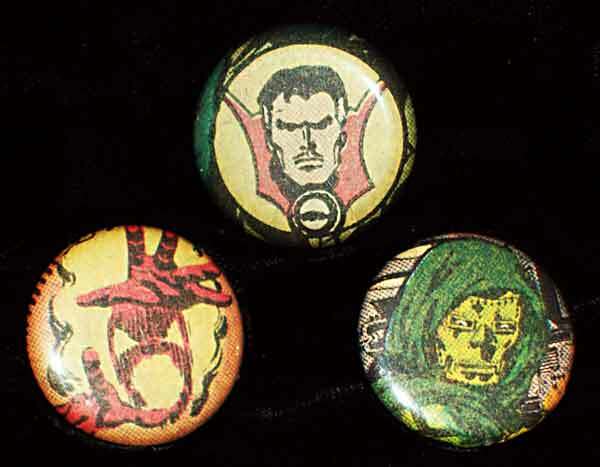 Centered around the dark and mystical characters (mostly the Dan Ketch Ghost Rider who was wildly popular at the time), the Midnight Sons was a favorite branding for me (if only the quality of the comics was any good). 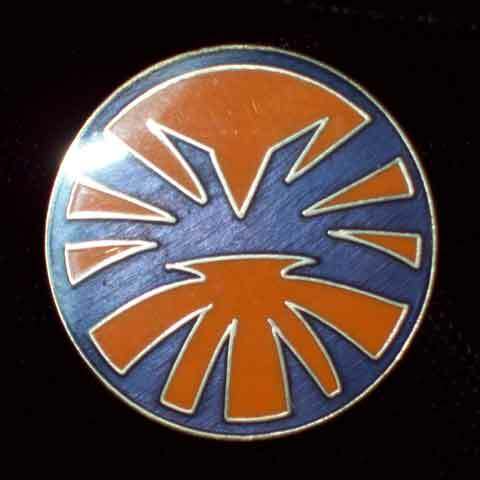 This pin is also copyright Marvel and Planet Studios (who seem to be the manufacturers of the Cloisonné pins made after 1990). As is the case with many of the items in my personal collection, I've obtained a 2nd of this pin. I'd have sworn I also had duplicates of a few of the other cloisonne' pins, but for the life of me, I don't know where they are. The Ghost Rider "mystic gas cap" (don't ask) icon. 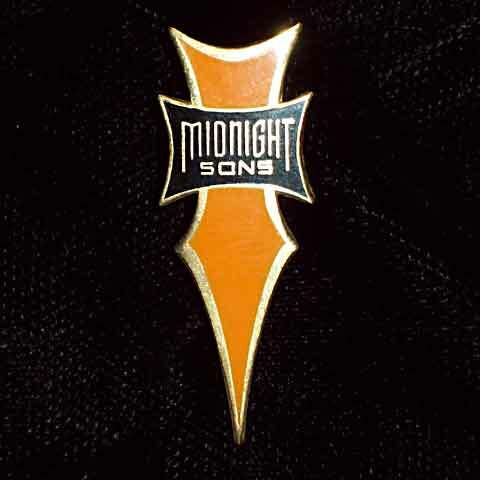 As much an integral logo as the 'Midnight Sons' one above. Here are a few of the "6-Dimensions" Cloisonné pins that I still have in my personal collection. I do have others, but they're probably going to hit eBay one day soon as well (perhaps even a few of these). Each of these utilize artwork from their various comics. OK. This is my ONLY Clip-On / Badge featuring Doctor Strange. Near as I can tell, it's the ONLY one there ever was. 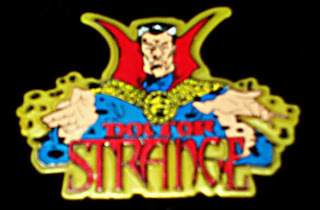 Packaged with the Doctor Strange action figure in the Amazing Spider-Man animated series line by ToyBiz in 1996, this is made of plastic with the image embossed in high-relief. There's a plastic clip on the back that can also flip back to transform this badge into a mini standee/sign. Similar to the one above for Doctor Strange, these came packaged with action figures in that same Spider-Man Animated Series action figure line. 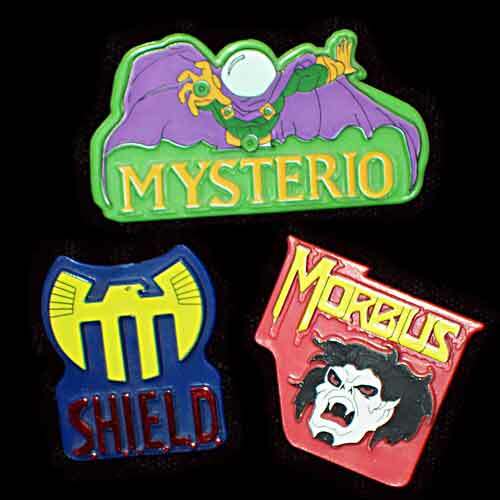 I got Mysterio (because he's freakin' cool, that's why), Morbius and a SHIELD one that came with a Nick Fury figure. These type of badges are seen frequently as promotional materials or premiums. Alas, no. 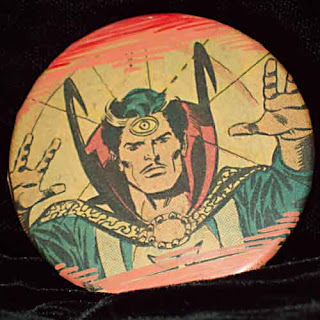 This is also not an "Eye of Agamotto" badge, but instead, one that I received as an entrance badge during a visit to the Museum of Natural History - or the Metropolitan Museum of Art (I forget which) many years ago. 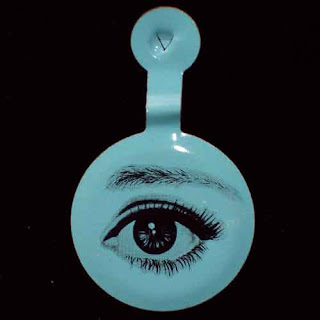 But I keep it with my Doc buttons because it's an Eye. So sue me. This button is one that I keep as a "Cautionary Tale", to remind me about the perils of items for sale online. Y'see, I saw this as a small, out-of-focus pic on an eBay auction, which touted it as something from an "estate sale". Was this a button that I was unaware? Surely, no one would try to pass off a blatant fake as a real item, would they? I needed to have it for the collection! Well, once it arrived, I saw it for what it was. A blatant fake passed off as a real item. It was a Dr. Strange sticker (from the 1960's Topps Marvel sticker/card series) adhered to a paper backing and made into an otherwise nice-looking button. THIS one is worse. But only because I've never been a fan of the art of Don Perlin in Defenders. Made especially for me by a friend (who did not know of my Perlin views) when my buddy got a new button-making kit (around 1988). I keep it because it was made as a gift and heck... it's DOC! What follows are several 1" wide pins. 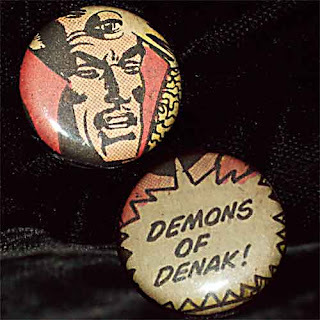 These were all purchased online (ebay, etsy) and, like the Don Perlin button above, are made of clippings from actual comics (SHOCK! CALAMITY! Oh, the HUMANITY!). The Doctor Strange one up top was drawn by Sal Buscema and is taken from a Christmas-time subscription advertisement (Doc's head is in a wreath), Dormammu's head is drawn by Steve Ditko and is from the splash-page to the classic 'Strange Tales' # 140 ("Pincers of Power"). 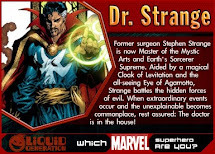 Next, the Doc profile is taken from the "corner-box" of an issue from his "Master of the Mystic Arts" series. There were only a few issues with an orange background there, so I could pin-point it if I were that nerdy (I'll do it later, for sure, but this post is late enough as it is *Dang, I'm SUCH a geek... 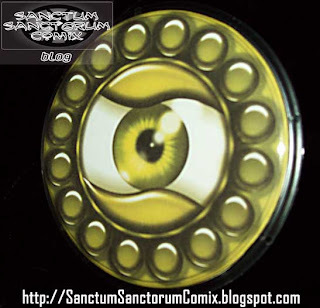 I just checked and I can state definitively that it came from the cover to # 19 - due to the location of the TM symbol and a green strip of color which are around the back of the pin - all indicators of # 19.). 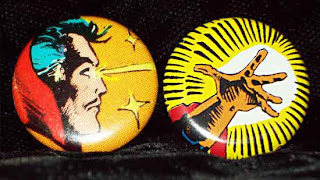 The hand is from a Steve Ditko "Mighty Marvel Pin-Up", originally published in 'Strange Tales' #128, and more recently reprinted as the cover of the comic that was packaged along with the Marvel Legends Doctor Strange action figure - which is from where this button was clipped. These are the only buttons with art clipped from actual covers, as the paper stock is slick. 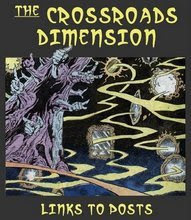 This batch utilizes Steve Ditko drawn head from 'Strange Tales' # 137 )"When Meet the Mystic Minds). 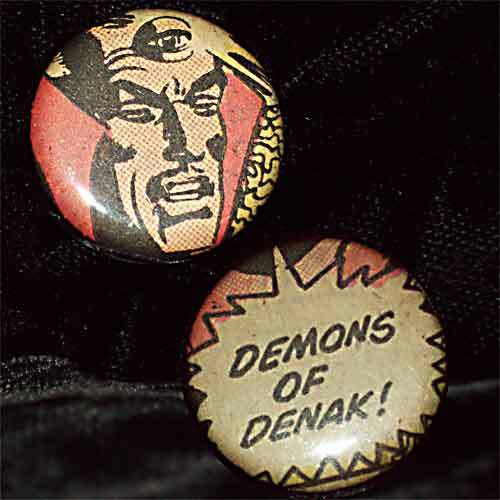 The "Demons of Denak!" word-balloon is from issue #23 of "Master of the Mystic Arts" written by Marv Wolfman and lettered by Joe Rosen (YES, I flipped through DOZENS of issues until I found it - and it wasn't easy - you wouldn't believe the number of times it is used. But, I found the exact panel that matched the shape of the balloon and the fact that the artwork lines up perfectly [that's the shadow of Doc's jaw at the top and his neck just above the balloon, with the cloak and even the panel border lining up]. Shoot me now). Using a silver paint marker to delineate the window's "bars" and black paint applied directly to the inner side of a plastic "reusable" button (probably intended for photos and whatnot), I made this to wear on the lapel of my black trenchcoat back in the day. I may have to remake a new one to wear these days. I forgot how much I liked this. Back when I used to frequent comic conventions as a professional comic artist (1989 - 1991) aside from drawing commissions then and there, I also came with pre-drawn and hand colored illos and also had a few buttons, like this one, which were photocopied from my drawings and hand-colored by marker. Obviously, since the 1989 version was a rough-looking button and a product of its time, I thought it would make sense to remake the Eye utilizing my computer skillz in Adobe Illustrator and Photoshop. I'm listing this one last, even though it wasn't the last one made, purely because it's so different (and technically, isn't complete). Constructed from a metal ball-bearing wheel housing (from some sort of machine - those little nodules are actual ball-bearings,) I painted it with enamel paint and covered it in a clear glaze (with the intent to finalize it with some metallic paint and a final clear-coat). Sandwiched between the front and back plates is a hologram of an eye. The effect is that the eye moves and looks around and is recessed slightly behind the outer rim of the amulet. Before it is officially complete, I'll probably give it some "eye-lids". Maybe movable ones! However, lest you think that these are the only "Eyes of Agamotto" in my collection, fret not... for I have made at least one other (but it is a medallion! 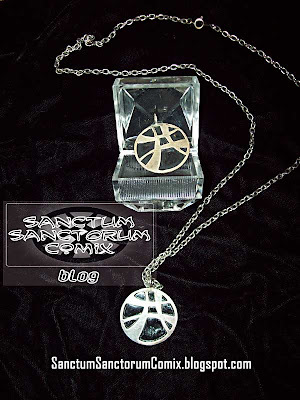 ), and I have other medallions and pendants as well! So, be on the lookout for THAT next installment of this series! Part 3: MEDALLIONS and PENDANTS!